You can set all types of products ( Simple Products, Grouped Products, Configuration Products, Bundle Products, Virtual Products, Downloadable Products) as best seller products. 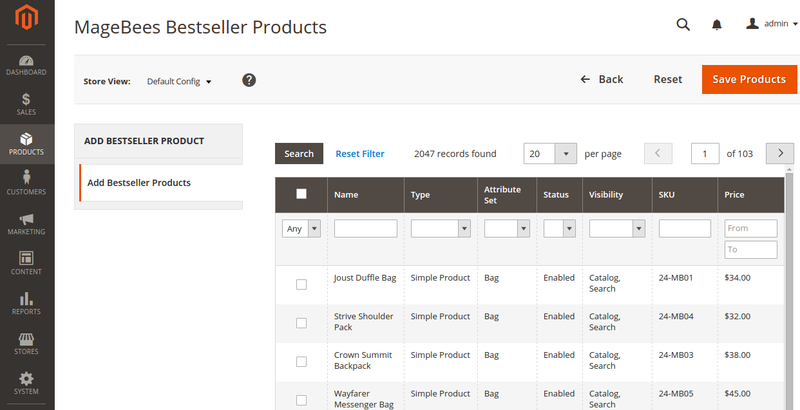 You can set best seller products limit. 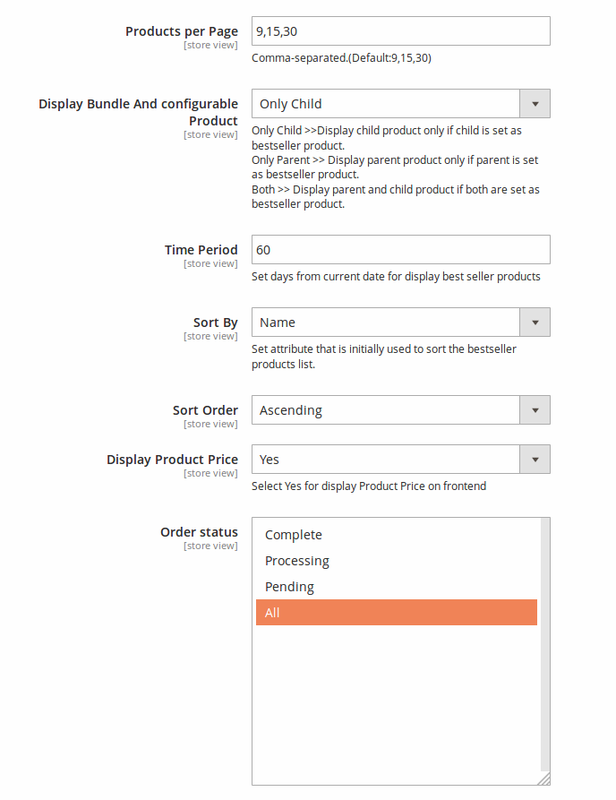 You can display only parent, only child or both products for bundle and configurable type products. 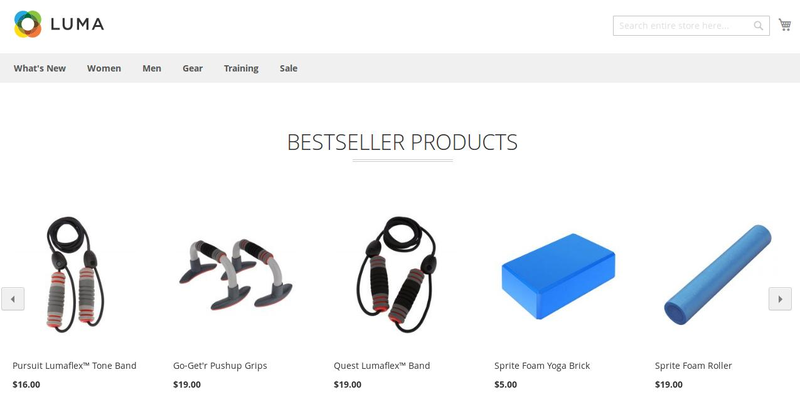 Using this extension you can show bestseller products for your online store. 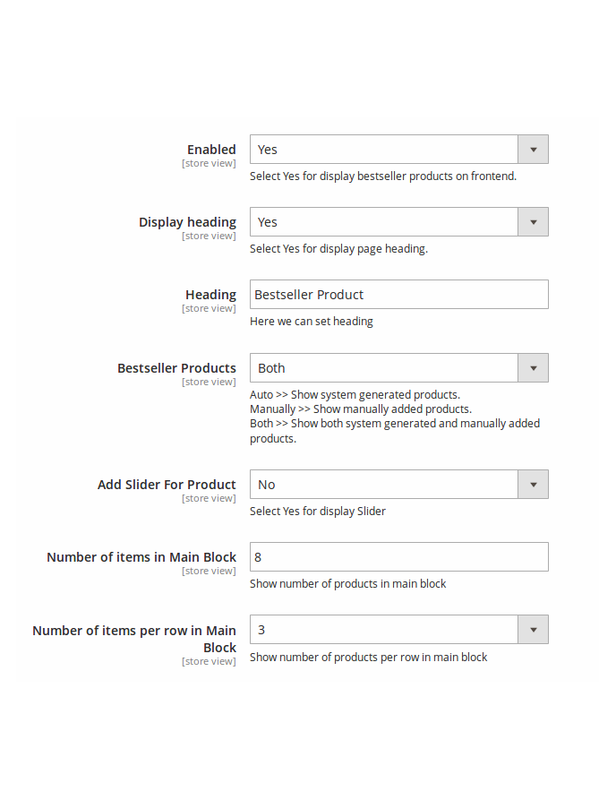 You can setup bestseller products slider. Our extension is easy to setup and give many options for settings from admin. 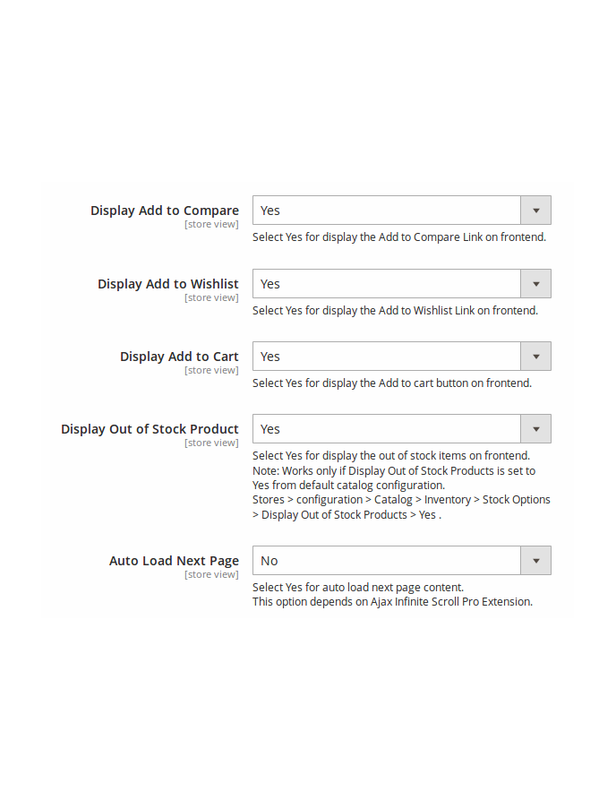 Using following embedded code you can display bestseller product block in any cms pages or phtml pages. 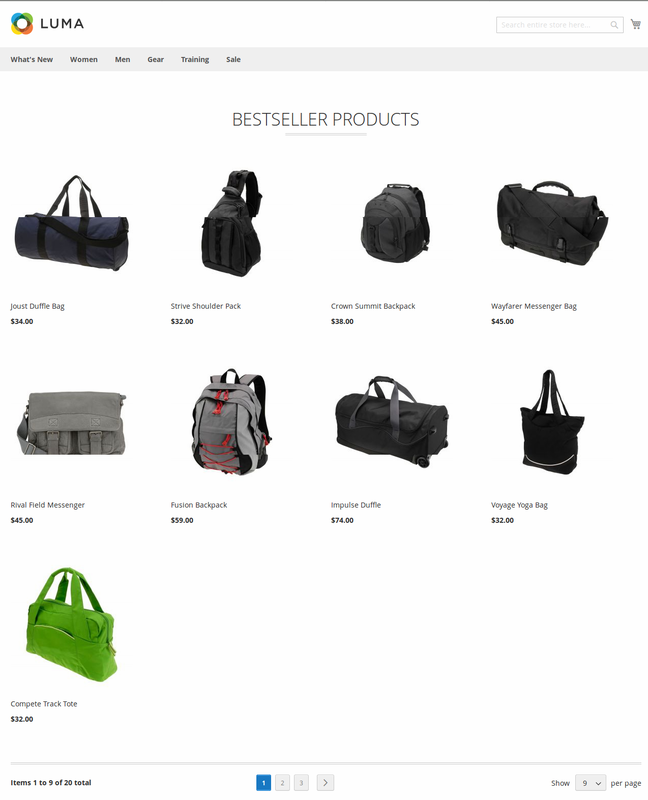 Nicely designed and separated bestseller products grid where you can select your bestseller products, search products. 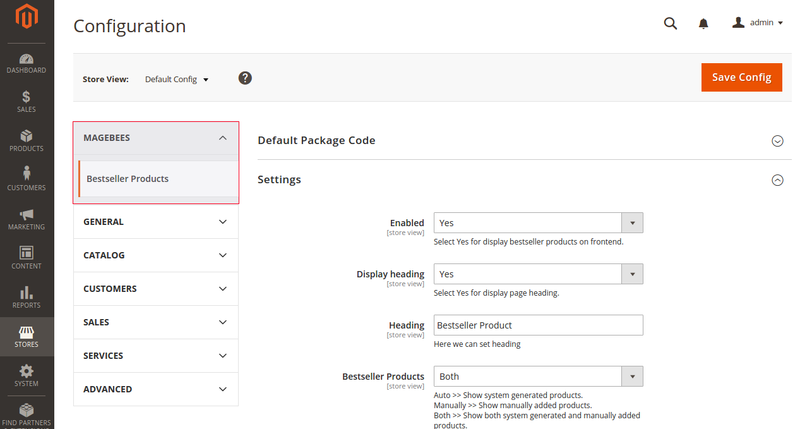 Bestseller Products Extension is very flexible for configuration.There are lot of options in the admin like Show/Hide buttons , Enable / Disable Slider , Set product limit etc. 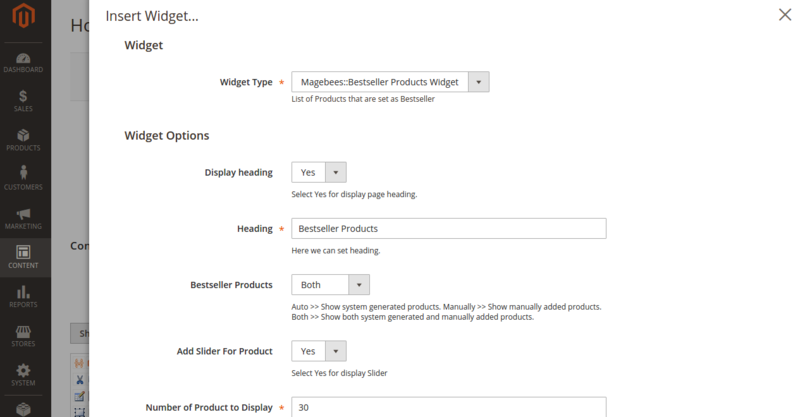 You can also do bestseller slider settings. I check many company bestseller extension but this extension provide complete features which I am looking for. 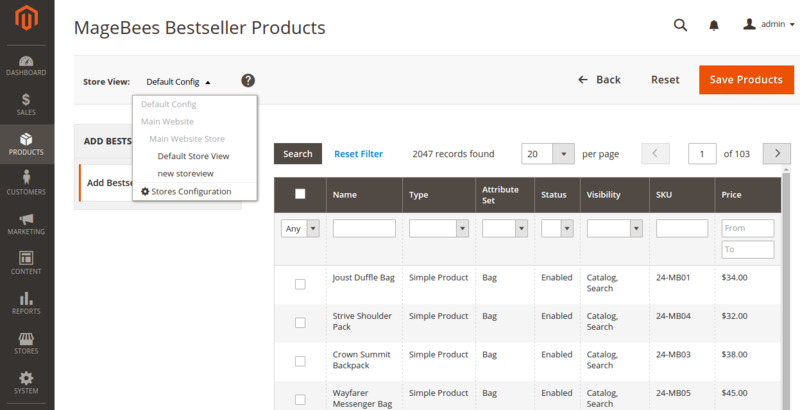 Show bestseller products automatically and also set manually bestseller products. Awesome Best Seller Extension And Extraordinary Support! The support team of Magebees is extraordinary. I am exceptionally happy with the best seller products extension , I am happy that it enhanced our site's user experience. One of the best Best Seller Extension in the market with complete features and easy to install and configure. Very happy to using. Thank you MageBees Team. Previously, we used Magento 1 Bestseller extension from MageBees and we are satisfied it. We upgraded our store from Magento 1 to Magento 2. We used Bestseller Extension for our Magento 2 store and fully satisfied with support and feature of the extension. Thank you. We utilize this extension in our ventures, it works awesome, simple to customize and extremely nice set of features.Contacted support few times, their reaction time is quick and will help u.Great extension, extraordinary support. This extension is precisely what I was searching for, Works as portrayed with no problems.Highly recommended extension from Magebees. 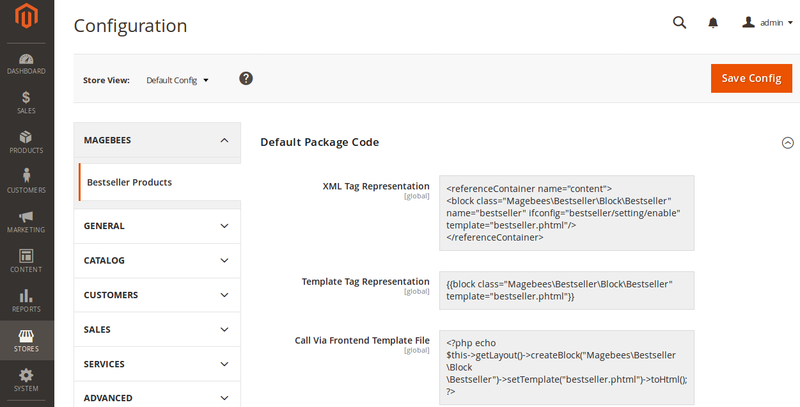 I was using MageBees Bestseller extension for Magento 1 and now we moved to Magento 2 platform and we bought this extension and its work like a charm. Happy to use MageBees Extension again. Thank you MageBees Team for providing top notch support. Easy to install and works as described into the document. Very nice features. A++ extension. we are using this extension in magento 2.0 and Extension works perfectly fine as mentioned in description. => Display Product Rating For Best Seller Products. Q-1:How to manage manually bestseller products storewise? Ans :Go to admin -> MAGEBEES -> Bestseller Products -> Manage Products Manually. Click on "Add Bestseller Product" button .You will get following screen .You can select store as shown in following screen, Then You can choose product using select checkbox. After click on "Save Products" button for save data. Q-2: I am getting error in console for magebeesBestseller.js not found ,How to solve this problem ?